Oh it feels so nice to be doing MMNs again. So yes, I am back from my blogging break and it was seriously so good to just take a step back and read some books that I have been meaning to in ages. Not much has been really happening in the Melanie world, but I find it a little crazy how it’s already half way through August and the fact that I am nearly 15. I mean god, that’s just ASDFGHJKL; I’m still trying to determine whether or not it’s a good or bad thing. *strokes beard thoughtfully* Anyhoo, I am currently in the midst of choosing my subjects for next year. I am getting up to those exams-that-determine-your-fate soon enough, and I am planning on taking Biology, Chinese and Economics for next year then probably Maths Methods, English Lit, English Language and Chemistry the year after that. Totally exciting stuff here, guys. Today we’re celebrating my older brother’s birthday, he’ll be turning 21. After that I have a work party for one of my fellow employees who I not so secretly dislike. I’m pretty much attending the party for the food and for my co-workers who I actually love to bits. *cue inhumane squealing* ERMAHGERD THIS BOOK. I am not really sure if I’m ready to see the end of Percy’s story but THE EXCITEMENT. I CANNOT. *drools* I need this so bad. Like REALLY BAD. Like I WILL GET ON MY KNEES AND BEG AND SELL MY SOUL BAD. – The Midnight Garden participates in a “what’s on your nightstand” feature. They highlight one of YA Midnight Reads’ own: Larissa. These are some of the books I received during my hiatus. Because I am the world’s laziest person, I won’t be showcasing the ebooks I got because there’s a whole truck of them and well…I AM LAZY, OKAY? DEAL WITH IT. I am definitely most excited about Heir of Fire here for obvious reasons, and it just looks so gorgeous and BIG. I decided to snag Ghost House mainly because the author went to my high school and actually had the same English teacher I currently have which is pretty darn awesome–I do hope it’s better than her Halo trilogy which was…well, bluuuuurgh. Simon vs. The Homo Sapiens Agenda: I won this lovely giveaway from The Midnight Garden. It’s a signed ARC and actually my first book I own that’s signed (: The author also included oreos (they have a role in the story, apparently page 276 is when I should dig in) and what sounds like an amazing recipe for oreo truffles. I’m really excited to read this ARC, it sounds so promising. However Ill try to do so closer to the release date, which is Spring 2015. 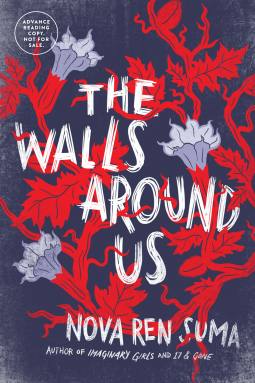 The Walls Around Us: I’ve actually never read anything by this author, however some of my trusted blogging friends utterly rave over Nova’s writing. It’s because of this that when I saw this on Netgalley I immediately requested it. The premise itself seems completely haunting and I have really high hopes for this novel. That’s all from us this week! What books did you get this week? Me too! I’m so jealous that Mel got a ARC of it. I really did enjoy Chasing Power, it was a nice surprise. Oh you had a lot of books, I hope you”ll enjoy them all. Happy reading and enjoy! I can definitely recommend Chasing Power to you, I enjoyed it so much more than I thought I would. Hope you all have a great week coming up, and good luck with school and work!! Glad to see you are back and have had a nice blogging reprieved Mel. Caught you over on The Midnight Garden, Larissa and loved the post! Sounds like a rather exciting week for the pair of you. Oh, oh you won a book and OREOS? That’s a fantastic prize to be honest. Hehe….oh and the book looks good too. 😉 YAY THAT MEL IS BACK! Omg, though that’s the first time I’ve seen Heir of Fire from the spine. It’s…it’s huge. IT’S MASSIVE. THAT IS EXCELLENT NEWS! It’s like the first time I’m actually excited about reading a book that big. 😉 Hehe. OMG RIGHT? Very jelly of Larissa. haha, yes and HoF is gorgeous beside it’s prev. instalments! I am reading Heir of Fire now and it is quite good. I am curious about Feral and wow what an impressive haul. Hope you both have an amazing week! kimbacaffeinate recently posted…Sunday Post #121 Blogoversaries, Books and Audios Oh, My! I look forward to your review of it! Great edition of the Midnight newsletter guys! Mel you are growing up before our very eyes <3 OMG SO EXCITED ABOUT HEIR OF FIRE. HOW EXCITING! I requested The Walls Around Us as well, it looks so awesome and I love Nova's writing.